souvenirs, gifts, awareness programs, wedding favors and for promotional advertising. 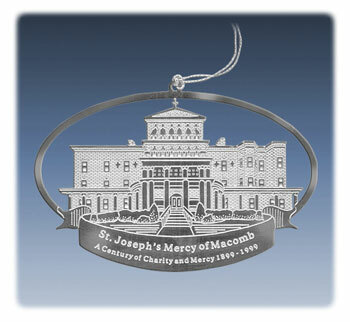 COLOR: Add $0.50 to each ornament. 4-5 weeks for production and delivery. 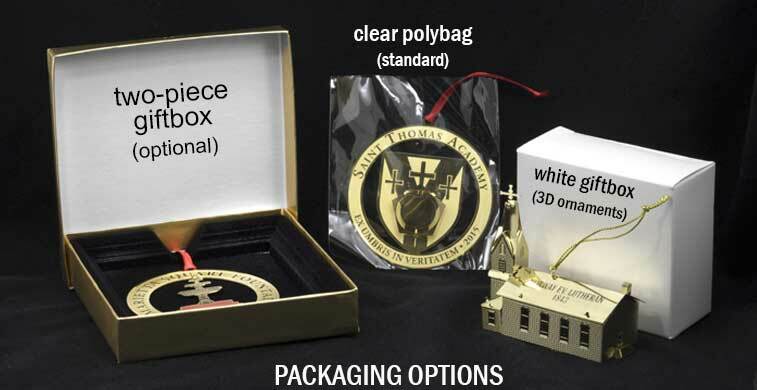 $11 per 100 ornaments (w/polybag). 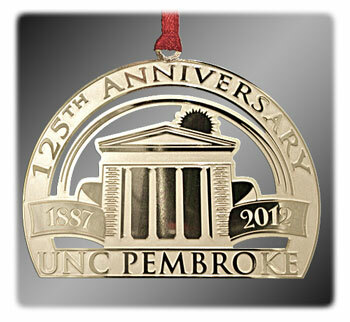 $22 per 100 ornaments (w/gift box). 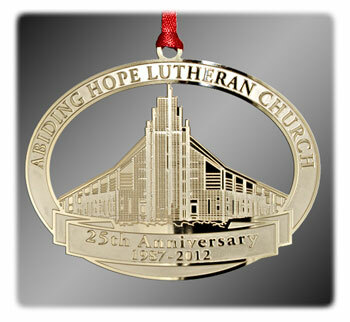 Our custom brass ornaments are available in two thickness, .5mm and .3mm. 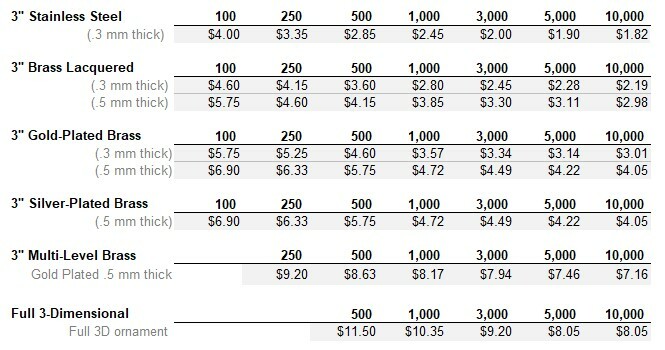 The thinner version provides an option for those whose primary consideration is price. The thicker (.5mm) version has a noticeably higher perceived value, and is the thickness most commonly used. We can send samples of each to help you decide. 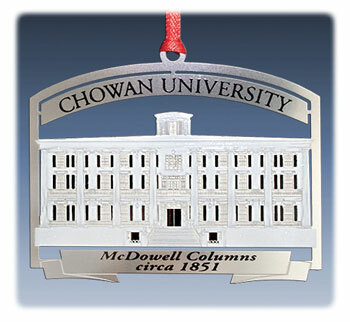 Please send an e-mail to info@howehouse.com to request a sample. 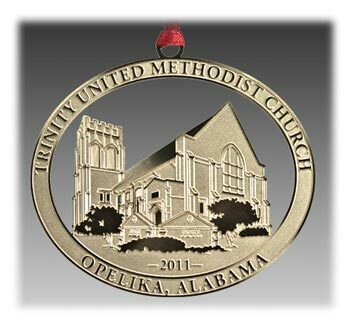 Our brass ornaments are available in a variety of finishes including gold plated, lacquered, silver plated, and stainless steel. 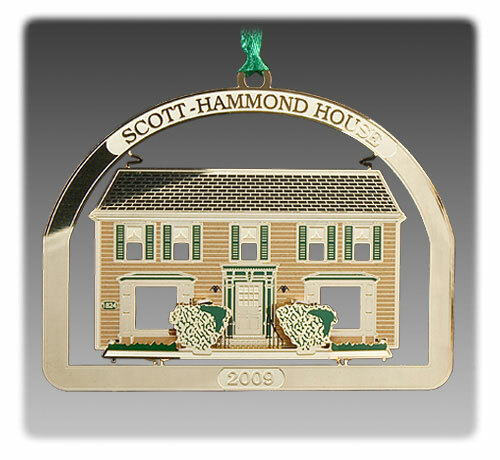 All finishes are resistant to tarnishing and will look like new for many years. 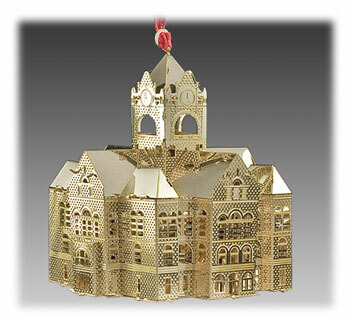 Gold and silver plating provides the highest luster and shine. We can send samples of each to help you decide. Please e-mail us at info@howehouse.com to request a sample. 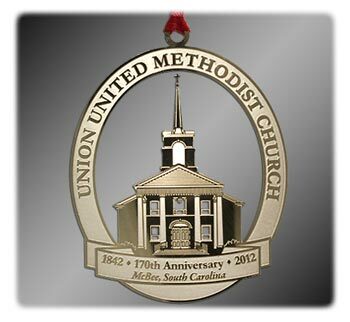 We consider 3 inches* to be our standard size; however, as a custom item we can make virtually any size or shape. If your budget demands it, we can go as small as 2 inches, If you’re wanting something special, we can go up to 5 inches. *We measure according to the longest dimension (length or width). The process starts with the virtual mockup. 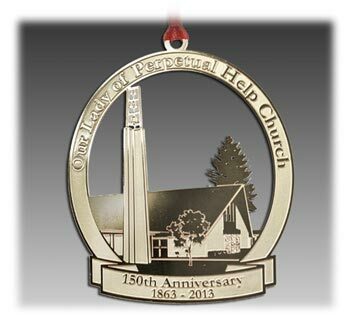 A form to request your no-cost, no-obligation, ornament mockup can be found here: Brass Mockup Request Form. What’s needed in order for your company to prepare a mockup? How does the brass lacquer finish differ from gold-plated? Both finishes protect the brass form tarnishing. The main difference is color. 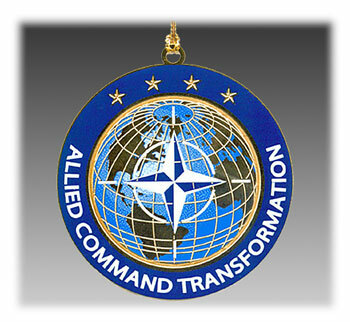 Lacquered brass shows the natural color of brass (which is a bit more yellow than gold). Gold plating also gives the surface a more reflective quality. 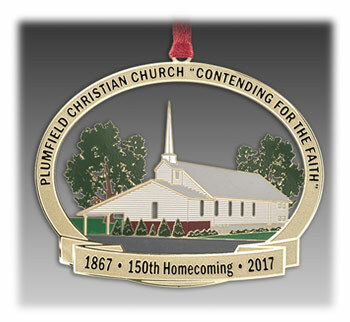 How are the ornaments made? 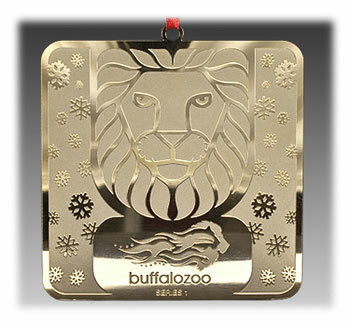 Our brass ornaments are made using a process called chemical photo etching. It works by first printing the design on a special film. 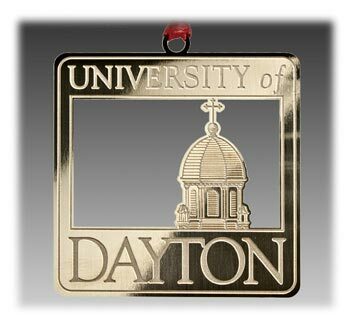 When applied to a sheet of brass, the film acts as a mask that allows chemicals to reach only the areas to be etched. After the sheet is chemically etched, it is either plated with gold or dipped in a clear lacquer. 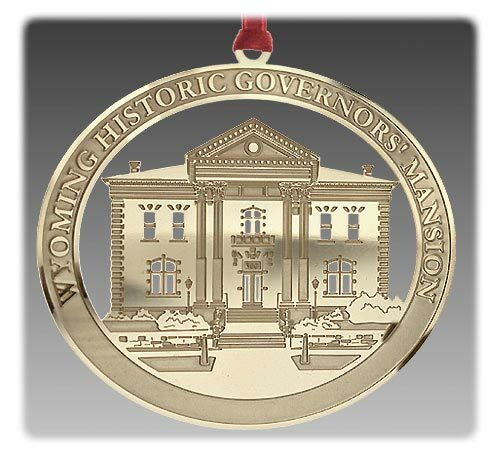 Do the ornaments come with the ribbon included? Yes. The ribbon is included, and attached. Please allow one week for us to prepare your mockup. 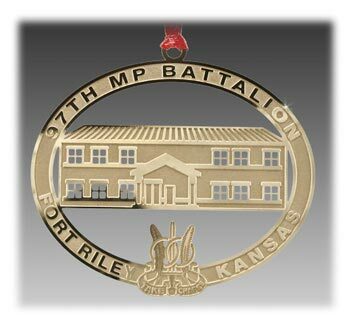 Once approved, we need 4-6 weeks to produce and ship your ornaments.